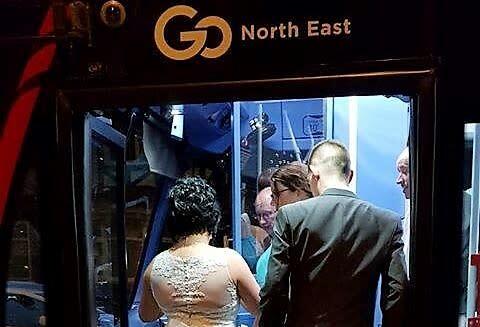 Riding the bus home at the end of the evening is typical for many bus passengers, but for Colin and Kayleigh Thompson, choosing the final Go North East Drifter 60 service on 5 May marked the beginning of their lives together as husband and wife. 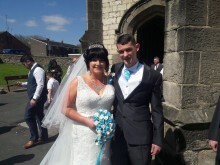 Eager to make their special day ‘a wedding to remember’, after the traditional nuptials at St John’s Church in Seaham, the County Durham couple held a quirky reception filled with family entertainment – followed by a journey home on their local bus service. 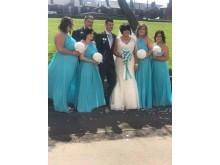 The post-ceremony celebrations included guests being treated to a bouncy castle, glitter tattoos, balloon-making and a caricaturist at popular Sunderland venue, The Alexandra before the new Mr and Mrs Thompson travelled in style back to Seaham Harbour. 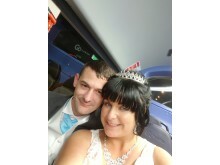 Joined on their marital bus by merry members of the wedding party, bride Kayleigh and husband Colin, who have been together for over 14 years, journeyed on to make more memories. Kayleigh said: “We wanted to finish our day with something different, so instead of getting a car or taxi back to Seaham, we thought it would be fun to get the bus - I often use the Drifter service to travel with our three-month old daughter as it’s much easier and convenient than the car.